Holy well and holy tree, Mazar “Manjyly Ata,” at the southern beach of the Yssyk-Kol (holy) lake in Kyrgyzstan. Photo: Sigurd Bergmann, June 2009. 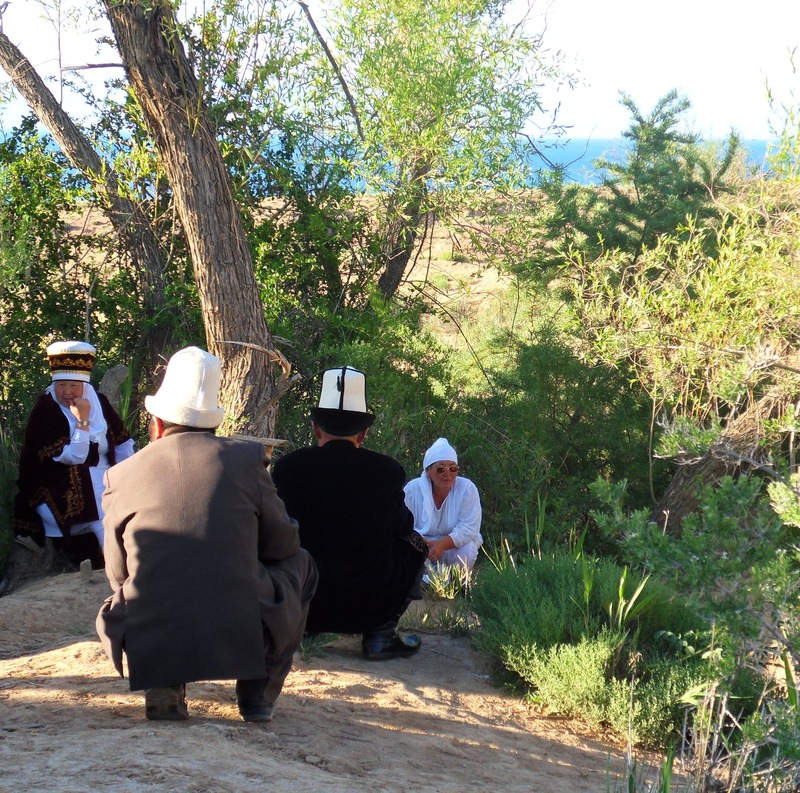 Holy places and sites are called “mazar” in the popular Islam of Kyrgyzstan (a synthesis of traditional “immigrated” Islam and older shamanic folk religion). The Mazar Manjyly Ata is one of the largest in the country; it is about half size of Munich’s English Garden. Holy trees, wells, and chapels have been (and are still) regularly visited by believers of all kinds who travel to the site in order to talk and pray to and with the trees, to offer gifts to God, the spirits, and the Spirit, and to experience healing and spiritual comfort. In spite of (or perhaps thanks to) condemnation from Soviet and Islamic leaders of such rituals, which mostly had to be conducted late at night, the belief practices in and with nature have been strengthened in such a way that local spiritual guardians of theses holy sites and local leaders have significant influence on political processes in the country – a country that remains badly affected by its Soviet legacy (and is, in addition, stuck between powers such as China in the South and Russia in the North). One can only speculate with fear and dread what would have happened to the beautiful countryside along the famous silk road – and to its associated culture – without such close entanglement of religion, place, culture, and the environment.